History of the Glyndon Congregational U.C.C. This history appeared in a church directory published in the early 1970s and in Clay County Family Album: A History of Rural Clay County (Dallas: Taylor Publ. Co., 1976, pages 281-282). The Glyndon town site was established about April 15,1872. The township was organized May 28, 1872. The first public religious service within the townsite was conducted by F. J. Call April 21, 1872. It was a prayer meeting held in an old lime-house on the north side of the railroad track, corner of Main Street and Park Avenue. The first preaching service was conducted by Rev. Alonzo T. Deming, May 5,1872. He passed away in August of that same year. The "meeting house" was a cloth tent, called the "Glyndon House". On June 9, 1872, Rev. E. S. Williams officiated as the first minister of the congregation. It was on this day that the question of church organization was first broached. A Union basis of organization was decided upon and a Council was called to perfect the work, to meet August 10, 1872. The Rev. E. S. Williams served from 1872 to 1873. First Congregational United Church of Christ (Glyndon, Minn.). Twenty-six Christian men and women joined in forming "The Church at Glyndon". These 26 charter members were (1) Rev. A. T. Deming (2) Mrs. A. T. Deming (3) Rev. E. S. Williams, (4) Mrs. Frankie Williams, (5) Mr. William Morrison, (6) Mrs. Susan Morrison, (7) C. B. Kittredge, (8) Kate Kittredge, (9) A. A. Bassett, (10) Keziah Bassett, (11) Miss Clara O. Bassett, (12) S. R. Nettleton, (13) Mrs. Almeda Nettleton, (l4) J. P. Farmer, (15) Mrs. Farmer, (16) Miss Mary Farmer, (17) James McLennon, (18) Mrs. James McLennon, (19) Harvey E. Cooke, (20) W. F. Simpson, (21) Jasper Struble, (22) C. S. Weaver, (23) Martha Purdy, (24) F. J. Burnham, (25) F. J. Call, and (26) L. B. Parker. The first church, which was a frame structure, was erected in 1873 at a cost of $700.00. This was located directly north of the present Congregational parsonage which was built in 1964 on Eglon Avenue. This first church was sold to the Methodist Episcopal Society, which later sold it to the Swedish Lutheran people. The present Congregational church was built in 1883 at a cost of $5000.00. During the summer of 1873 Rev. George Rogers came and served the church for two years; then Rev. P. W. Howe was the next minister serving only a short time leaving the church without a pastor for nearly six months. During the years of 1876 and 1877 the church went through difficult times with many people leaving and few coming. In the beginning of 1878 the church became self-supporting. Rev. George S. Pelton was the pastor during this time, serving from 1877 to 1880. Rev. Pelton was an uncle of Donald Grant, whose family has belonged to our church since 1886. The church records show that Frederic Glyndon Tracy, born March 2, " 1877, and Katie Maria Kittredge, born December 24, 1875, were the first to be baptized in the church on July 1, 1877. Arthur A. Mumford of New Westminister, B. C. became a member of the church as early as June 13, 1884. He served as Sunday School Superintendent for 14 years. Mrs. (Anna Osborn) Mumford and Mrs. (Bertha Bassett) Osborn joined the church January 3, 1886. Mrs. (Julia Bassett) Friday, sister of Bertha became a member of September 5, 1886. R. B. Webb and son, Halbert, joined the church in 1877. Walter Shave joined in 1891 and Hattie (Webb) Shave joined in 1892. These people were active in the church all their lives. Members of the Webb family who are still active members are Eleanor Bolin, Mildred Schultz, and Paul Schultz, who is a great grandson of R. B. Webb. The Young People's Society of Christian Endeavor was organized in 1884, with about 31 members. The first Junior Christian Endeavor Society was organized by Mrs. Ernest Game in 1910. Rev. F. E. Stillwell was minister at the time. It is interesting to know that our present lectern is the original one used in early days. 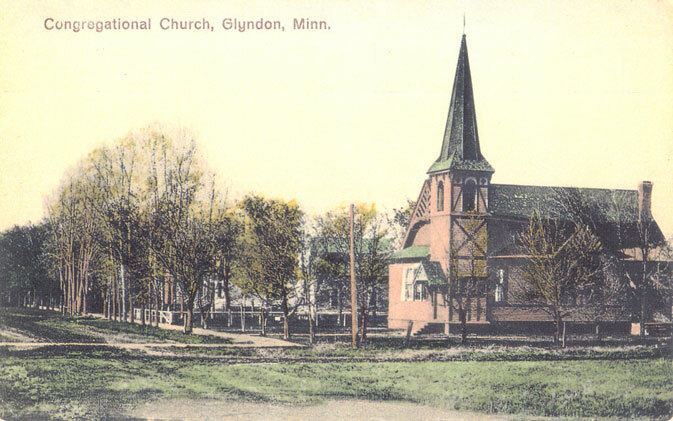 On March 30, 1921, the name, "The Church at Glyndon" was changed to "First Congregational Church of Glyndon". In 1922 joint services were held with the Hawley church continuing until 1924; and from 1933 until 1945, we were affiliated with the Downer Presbyterian Church. 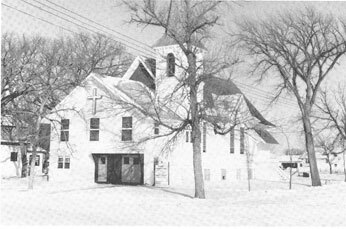 We became affiliated with the Ulen Congregational Church in 1946 for about a year. In late 1954 we formed a yoke with the Dilworth Presbyterian Church. This yoke was dissolved in 1967. We became self-supporting with the Rev. Kenneth Cook as pastor. Found in the church books was a "Lest We Forget" memorandum of the Grant Mortgage of $900.00 from the Congregational Church Building Society of New York. The mortgage was dated December 22, 1923. A loan was also taken for $1500.00 for improvements on the church building, being paid by the Ladies Aid at the rate of $100 per year. The loan was paid off in the fall of 1945. With the money the auditorium of the church was re- modeled, the chancel was moved to the east end of the church, and a full basement made. The total cost of the improvements amounted to $5182.06. 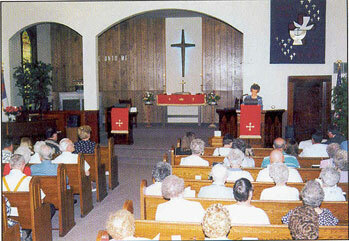 A 75th Anniversary Observance was held in 1947 when Rev. Bert Richardson was pastor. Rev. Richardson has the distinction of serving the church for the longest period of time. He served from 1947 to 1957, a period of ten years. Robert Gussner, son of Mr. and Mrs. Erwin Gussner (School Superintendent at the time), was ordained into the ministry in our church in August, 1957, when the church's 85th Anniversary was also observed. Our church joined the United Church of Christ on February 12, 1961. Rev. Irving Thompson was the minister. A narthex, church office, wash rooms, and a fellowship room were added on to the west end of the church in 1961. A new four bedroom parsonage was built in 1964 on Eglon Avenue. The first pastor to reside in it was Rev. Dennis Tooley and family. They held an open house for the congregation and friends on November 22, 1964. During the past few years whenever we were in need of an interim minister, Rev. Herbert Andrews of Ada willingly served. His family is tied in with the history of our church. He was born in the old parsonage. His mother was Mary Farmer who was one of the charter members of the church as were his grandparents, John and Martha Farmer. His father, Charles R. Andrews, was a brother-in-law of Major Luman H. Tenney who was instrumental in the founding of Glyndon. The basement was completely remodeled with a new kitchen; and a new hot water heating plant was installed in the summer of 1970. June 16, 17 and 18, 1972 was the Centennial celebration of the village of Glyndon and of the Congregational church. The Centennial Congregational church service was held in the Glyndon School gymnasium with several of the past ministers reminiscing with us of past days. Special guest was Rev. Herbert Andrews, with his history of the church going back to the early days. Our present [early 1970s] church membership of 165 and Sunday School membership of 92 is under the leadership of Rev. J. Edward Krueger, who came in June, 1971. Our Women's Fellowship is active in working on Mission Projects and working to raise funds to help church finances. Our young people through Pilgrim Fellowship groups are learning to be active in the church. We have omitted names for the most part and could only glimpse the record for the past, but we would pay our loyal tribute to all the heroic souls who have wrought through the years and bequested to us so rich a heritage. Our prayer is "That God's blessing may abide with this church and its descendants for generation after generation."